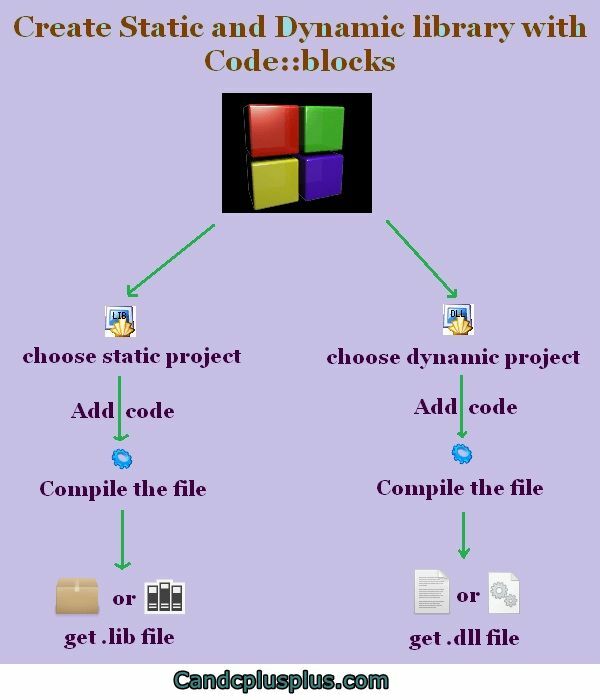 In this post we will see how to create static library with code::blocks and how to create dynamic library with Code::blocks. Static library and dynamic library are easy to create using Code::blocks. Here, we will also see how to link them to our console application. Open your code blocks and go to File->New->Project, you will see a new window, scroll down and choose Static Library as shown below. *Note::The library will be created without the header’s file, how to include the header file is shown later. Enter the program name “static_library” and click “Next” and “Finish”. You will see a new file main.c. Delete the three functions int SampleAddInt(int i1, int i2), void SampleFunction1() and int SampleFunction2(). Let’s add our own functions, copy and paste the two functions given below. Try running the program, pres Fn + F8. You will get a message “You must select a host application to run a library” and click Ok.
Now go to the directory where your main.c is present. In my case, the directory is “C:\My_program\static_library“, you will see your static library file “libstatic_library.a” there. Next, we will link the library to our console application. Create a new console application and name it “new“. Delete all the code and Copy and paste the code given below in your main.cpp. 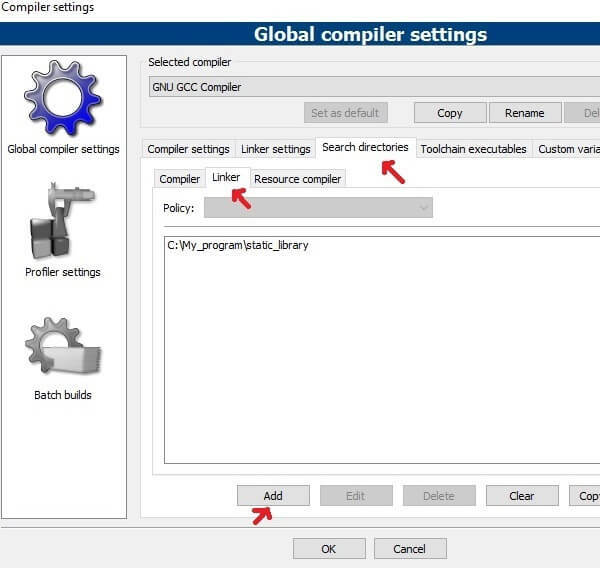 Go to Settings->Compiler and click on it, a new window will appear which is shown below. Select the linker settings and click on Add then browse to where your libstatic_library.a is present and click OK. Your program is now ready to run. Press Fn+F8 and there it is your console black screen. Lets add a header file to our static_library program. Open up your notepad or notepad++ and copy and paste the following code below. Save it as static_library.h in the directory where your main.c is present. Go to code::blocks and select settings->Compiler->Search directories->Linker. Click Add and add the directory where your static_library.h is present.The screen shot is given below. Now go to your main.cpp and delete extern “C” float Square( float f1 ) ; and extern “C” float Divide( float f1 , float f2 ) ; and include the header’s file #include “../static_library/static_library.h” and that’s it. Now run your program, press F8+Fn. *Note: You may be wondering why do we need to include “extern “c” ” while declaring functions name in the header file. I don’t know if you have realize or not, but if you look at the source code of the library file, it has an extension of .c which is actually a C language file, not C++ file. So,the file is compiled using the C compiler not the C++ compiler. The keyword extern “c” tells the C++ compiler while compiling that the function is taken from C compiled library, this help the compiler to call the correct library function.